Notice for International users of OME. The SQL Server login account must be set to a language that uses a date format with month before day. Day\Month\Year is not supported and affects all languages except English. This fix is only required for the following languages. Using typical install with an existing SQL Server Database. Using custom install to an existing SQL Server Database. 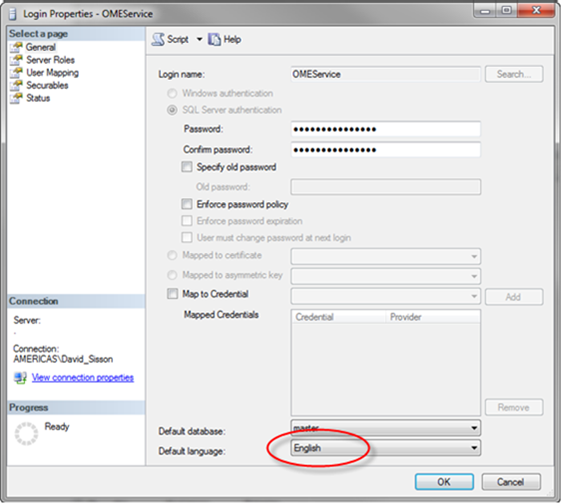 Within SQL Server Management Studio change the login account to use English by default. Note: You will need SQL Management Studio for this procedure. Development is working to resolve this issue. Re: Notice for International users of OME. So, not supporting the Day/Month/Year-format that the vast majority of countries are using. Dell should really hire a standards-guy so that Dell gets these things right the first time. Thanks for taking the time to post Andreas. OME _does_ in fact support day/month/year format in these countries. This is a specific issue where the SQL server _ login account_ must be set to a language that uses a date format with month before day. This is a setting in the SQL server account, not how OME will display the dates. (You could, if you want, create a special ome login for this.) With this SQL setting, OME will display the dates fine in the countries listed in the OP. The defect will be addressed in the next version of OME. Great! Not as bad as I first thought then. Thanks! Let us know how things go with you and OME.